Chicken soup might just be the most common home remedy for treating a cold or flu, but is it really an effective treatment against the symptoms of a cold or flu virus? As with most decaffeinated hot liquids, chicken soup has been shown to help temporally clear nasal congestion. 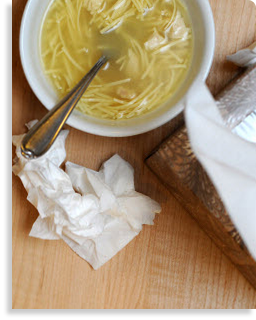 However, due to their high sodium content, many chicken soups could actually worsen cold and flu symptoms. Hypernatremia occurs when there is an electrolyte disturbance that is defined by an elevated sodium level in the blood. Because excess sodium has been shown to have dehydrating effects on the body, many types of chicken soup may actually have detrimental effects on the treatment of common cold and flu symptoms, making this the ultimate cold and flu myth. Staying properly hydrated is one of the most important things you can do when treating a cold or flu. Hydration can help to loosen mucus and assist in alleviating congestion. Though chicken soup may be the ultimate comfort food, its dehydrating properties may end up doing more harm than good when treating a cold or flu. K Saketkhoo, A Januszkiewicz, and M A Sackner. Effects of Drinking hot water, cold water and chicken soup on nasal mucus velocity and nasal airflow resistance. Chest Journal; Chest Publications. Retrieved December 15, 2011. Hypernatremia: Fluid and Electrolyte Metabolism; Merck Manual Professional. http://www.merckmanuals.com/professional/endocrine_and_metabolic_disorders/electrolyte_disorders/hypernatremia.html?qt=&sc=&alt=. Retrieved December 15, 2011.